Does everybody have their Thanksgiving menus planned? Or is everybody feeling calm and settled and ready with a game plan? Or somewhere in between? Unfortunately, Erlend and I won't be doing our traditional Asian-style Thanksgiving this year (since he's still in New York). 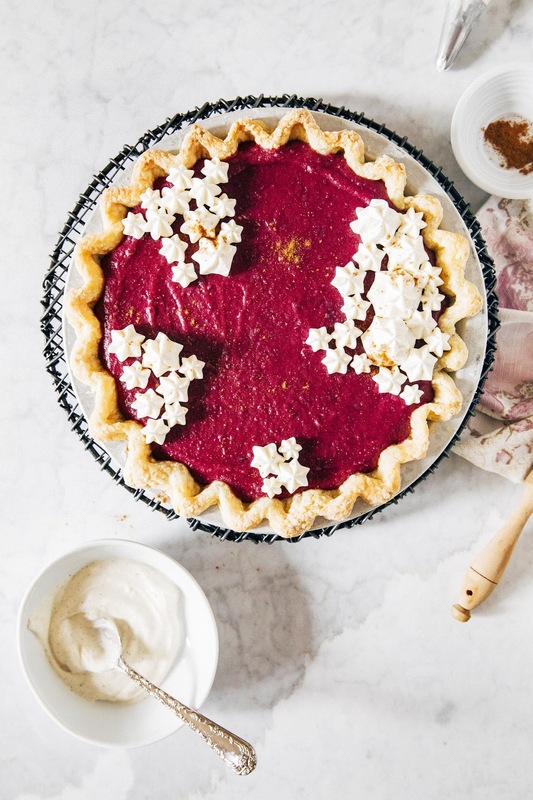 Instead, I'm hitting up two Friendsgivings on Thanksgiving day, where I'll be depositing a speculoos cheesecake at one (recipe on the blog sooooon) and this purple sweet potato pie at another. Soooooo I actually credit this recipe entirely to Erlend. Erlend likes food as much as I do, but in a different way: while I'm always experimenting in the kitchen or reading about new restaurant openings, he's always reading about various ingredients, cuisines, and their various histories. Erlend sometimes makes requests for recipes on my blog, most of which I actually ignore because I'm not the best girlfriend and/or his suggestions are usually not very good or photogenic. Sometimes his ideas are just too flat out weird for most people — he's always finding and buying rare/obscure ingredients at international supermarkets and online, insisting that I could totally try incorporating this weird root/extract/mushroom into one of my desserts. Yeah, no. 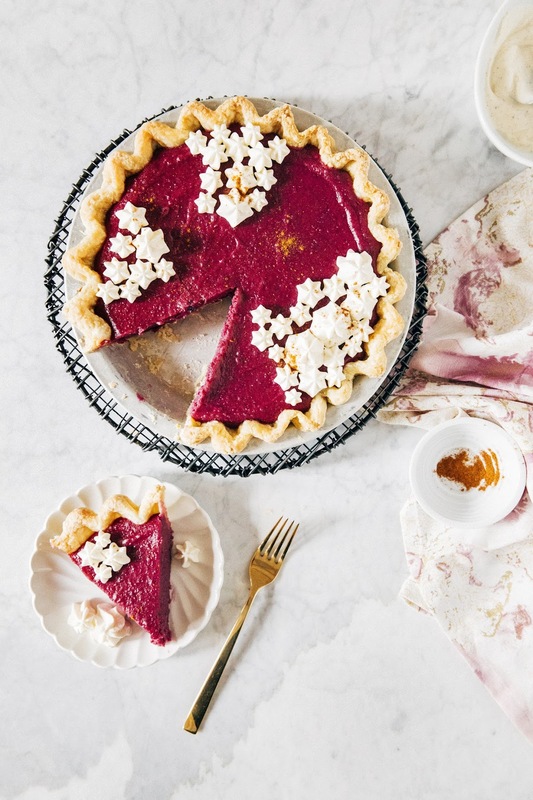 I saw how some of y'all reacted to the poll on my Instagram Stories about this purple sweet potato pie; I don't think you guys could handle the rest of his suggestions. Anyway, I do occasionally oblige Erlend when he has a good idea that won't scare most of you all away. And this was one of them: purple sweet potatoes in a dessert. Have you ever walked around a fancy organic grocery store like Whole Foods and seen a pile of purple sweet potatoes next to the regular ol' orange ones? They're basically the same thing, but purple. 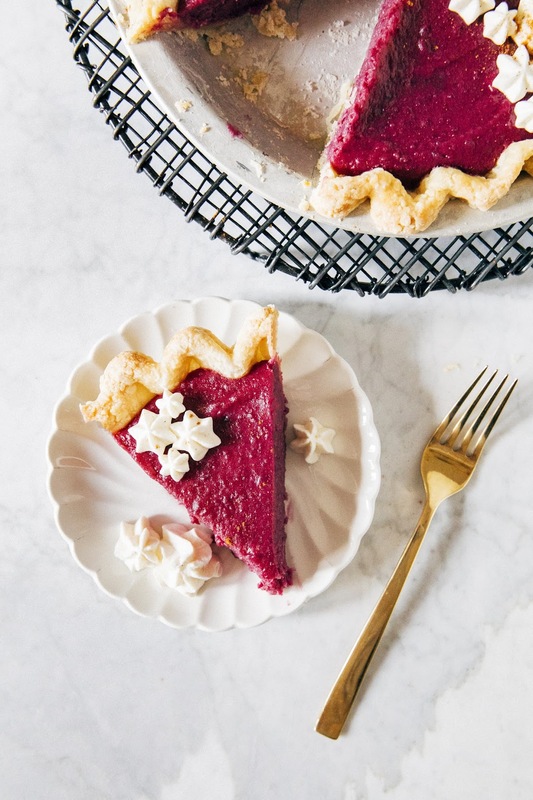 But don't get purple sweet potatoes confused with regular heirloom purple potatoes — purple sweet potatoes are as sweet as a sweet potato, and just like regular potatoes, you wouldn't want to bake the regular ones into a pie. For a long time, I dragged my feet on this concept. I was worried that the purple would turn a dull, brownish color when baked, but it actually worked out and turned into a vibrant (almost magenta?) color. The secret is to use an acidic fruit like lemon, which brightens the color. The overall result is a creamy, citrusy sweet potato pie with bursts of cinnamon and nutmeg. Enjoy! I noticed on Instagram Stories that some of you mistakenly thought I was baking this pie with ube, the sweetish purple yam that's popular in Southeast Asian countries like the Philippines (holla at my mom!). Not quite. There are a ton of purple sweet potato varieties, and there are distinctions between them: purple yams, winged yams (a.k.a. ube), taro and its varieties, different types of purple sweet potatoes like Okinawan and American purple, etc. I'm not really sure; Erlend is the person to talk to about all these varieties if you're really super interested. For this recipe, I used American purple sweet potatoes from a company called Frieda's that I found at my local Whole Foods. Oh wait! It turns out Frieda's has a guide to the different types of purple potatoes — no need to hassle Erlend, lol. Also yams and sweet potatoes are not the same thing, people! 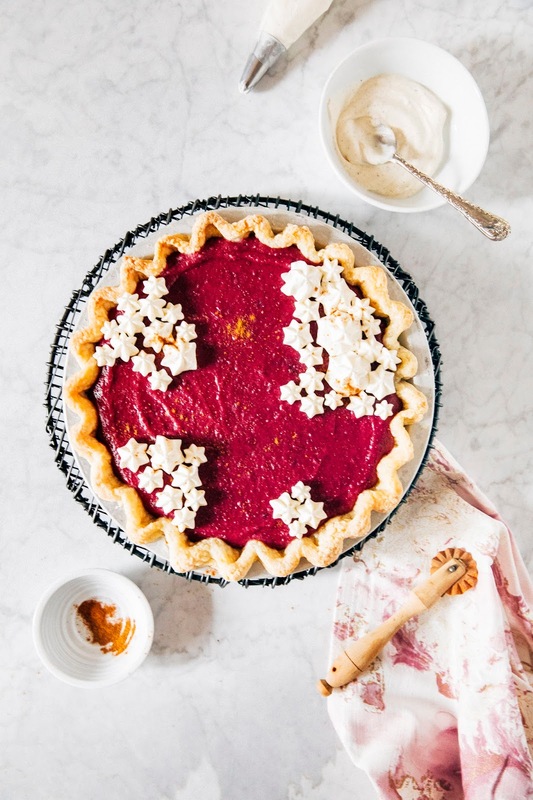 If you're planning on making this pie for Thanksgiving Day, I suggest planning ahead some because it's a bit of a labor intensive process. First you'll need to make the pie crust and blind-bake it before roasting some sweet potatoes for the filling. I like to make the pie dough up to a week in advance and blind-bake the pie before the day I'm going to be serving the pie itself to split up the work and make it so that I'm not stuck in the kitchen for 3 hours. Similarly, you can roast and puree the potatoes up to 2 days in advance and have them ready to go for when you make the filling. Just be sure to store them in an airtight container until then! In a liquid measuring cup, combine 1/2 cup very cold water, 1/2 cup ice, and 2 tablespoons apple cider vinegar and whisk to combine. Transfer to the refrigerator to chill while you work with the dry ingredients. In the bowl of a food processor, combine 1 1/4 cups all-purpose flour, 1 1/2 teaspoons granulated sugar, and 1/2 teaspoon kosher salt. Pulse a few times to combine. Sprinkle 1/2 cup very cold cubed unsalted butter over the dry ingredients, and continue pulsing until the butter pieces are about the size of a nickel. Remove the ice water mixture from the fridge and sprinkle 1 to 2 tablespoons over the dry ingredients, pulsing to combine. Continue adding water and pulsing until the butter pieces are about the size of a pea, and the dough sticks together when squeezed and pinched with your fingers. Use a rubber spatula to scrape the dough out into a lightly floured surface and use your hands to shape the dough into a flat disc. Wrap in plastic, and refrigerate for at least 1 hour, preferably overnight. Lightly flour a work surface and transfer your dough from the refrigerator to the surface. Let rest for 10 to 15 minutes, or until pliable enough to roll. Use a rolling pin to roll into a circle about 12 inches wide. 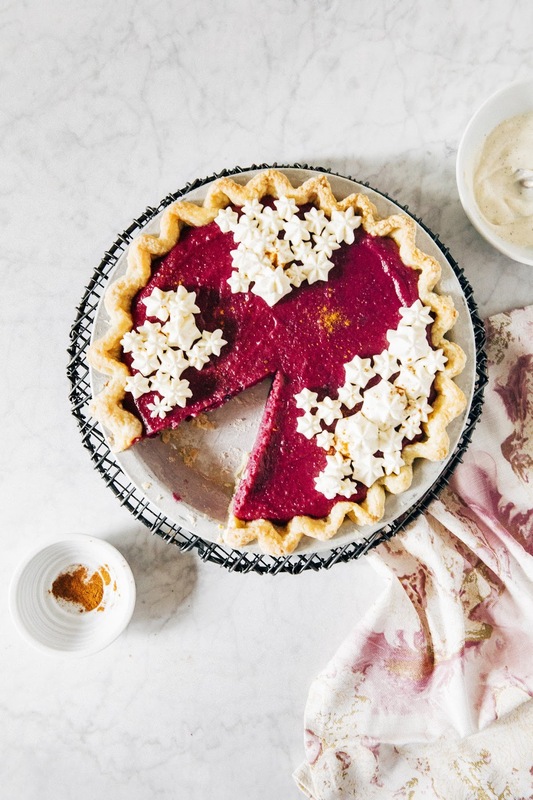 Transfer the circle on to a pie plate and fold the edges of the dough to create a rolled border sitting on top of the circumference of the pie plate, using kitchen shears to trim off any excess dough. Use a fork or your fingers to crimp the edges of the crust. Use a fork to prick the bottom and sides of the pie dough, and transfer to the freezer to chill for at least 10 minutes. Meanwhile, center a rack in the oven and preheat to 425 (F). Line a rimmed baking sheet with parchment paper. When the crust is frozen solid, remove from freezer and place on baking sheet. Cover the crust, including the crimped edges, completely with aluminum foil. Pour pie weights into the center of the aluminum foil and spread them so they are more concentrated around the edges of the pie shell. Transfer to the preheated oven and bake for 20 minutes, until the crimped edges are set but not browned. As the pie is baking, whisk together 1 large egg white and 1 teaspoon water. After 20 minutes, remove the pie pan and baking sheet of the oven. Lift the foil containing the pie weights, and let the crust cool for 1 minute. Use a pastry brush to coat the bottom and sides of the crust with egg white glaze. Return the pie pan and baking sheet to the oven's middle rack and continue baking for 3 more minutes. Transfer to a wire rack and cool completely before filling. Center a rack in the oven and preheat to 400 (F). Line a rimmed baking sheet with aluminum foil. Transfer 20 ounces purple sweet potatoes onto the baking sheet, and use a fork to pierce the sweet potatoes several times throughout their bodies. Bake in the preheated oven for 45 minutes, or until tender and a fork can easily be inserted into the center of each potato without too much resistance. Once the potatoes have been roasted, transfer to a wire rack and cool until they can be handled. Use a knife to cut each potato lengthwise, and peel the skin off each potato. If it's easier, you can also scoop the flesh from each skin — I started out doing this but found that I was losing too much flesh and that it was actually easier to peel off the skins. Once you're done with this process, you should have around 16 ounces of sweet potato flesh. Transfer to the bowl of a food processor and add 1 tablespoon freshly squeezed lemon juice, freshly grated zest from 1 medium orange, and freshly grated zest from 1 small lemon and process until the mixture is very smooth, about 30 seconds to 1 minute. Center a rack in the oven and preheat to 350 (F). Line a rimmed baking sheet with parchment paper and set aside. In the bowl of a freestanding electric mixer fitted with a paddle attachment, combine 1/2 cup dark brown sugar, 1/2 cup granulated sugar, 1/4 cup melted unsalted butter, 1 teaspoon kosher salt, 3/4 teaspoon ground cinnamon, 1/4 teaspoon ground cardamom, and 1/4 teaspoon ground nutmeg. Beat together on medium speed for 1 minutes, or until all ingredients are combined. Lower the mixer speed to its slowest setting and add 3/4 cup heavy cream, 2 large eggs, and 2 teaspoons vanilla extract, beating until combined. Add the sweet potato puree and continue beating until combined and a homogenous purple color. 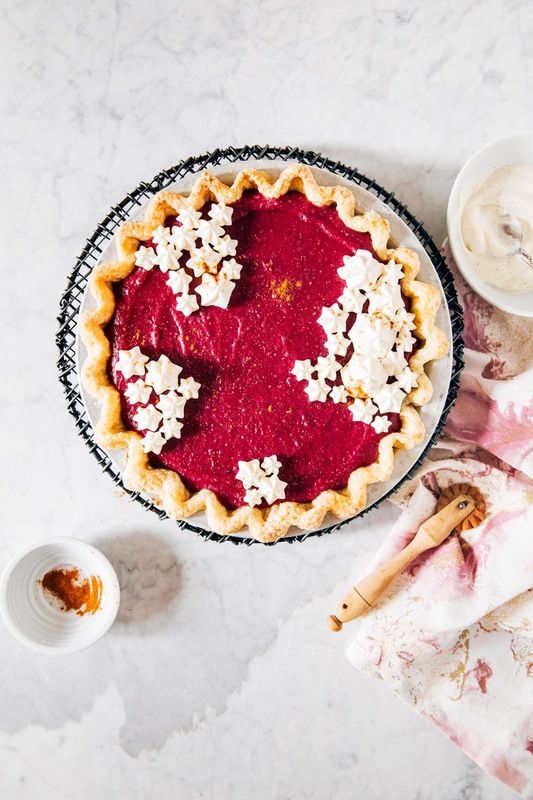 Scoop the filling into the par-baked pie shell, using an offset spatula to spread evenly across the shell and smooth the top. Transfer the filled pie pan to the prepared baking sheet. Bake in the preheated oven for 30 minutes, or until the filling is puffed and set around the edges but still has a slight jiggle in the center. Transfer to a wire rack and cool completely before covering loosely with plastic wrap and chilling overnight before slicing and serving with whipped cream. In the bowl of a freestanding electric mixer fitted with a whisk attachment, combine 1/4 cup heavy cream and 1 tablespoon confectioner's sugar. Beat on medium-high speed until soft peaks appear in the cream. Use a rubber spatula to fold in 2 tablespoons crème fraîche and serve immediately.